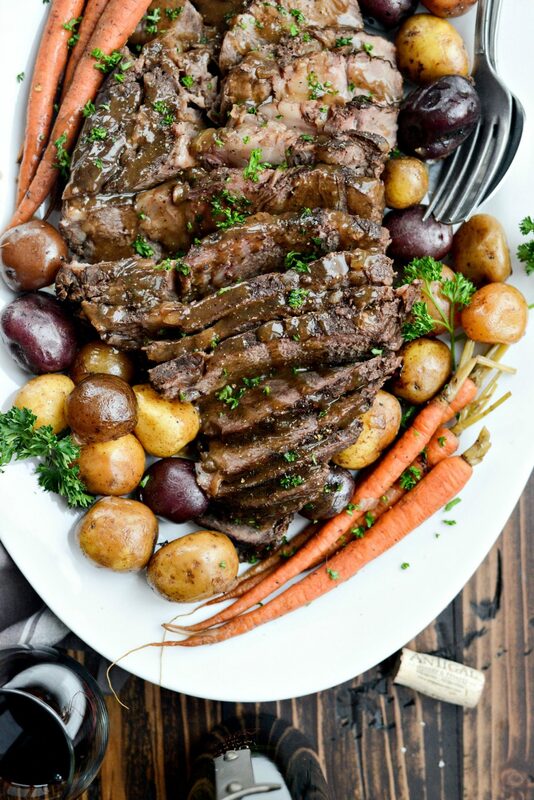 This Slow Cooker Balsamic Dijon Pot Roast is another recipe from my freezer kit repertoire, and it couldn’t be any easier. 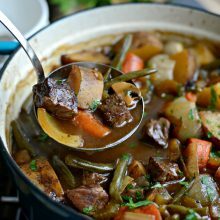 Beef chuck roast slowly simmers with potatoes and carrots with fresh rosemary and thyme in a balsamic, Dijon broth. And BONUS it’s freezer friendly and 95% can be made in advance, frozen and saved to be whipped up on a chilly day or when you’re just not in the mood to cook. 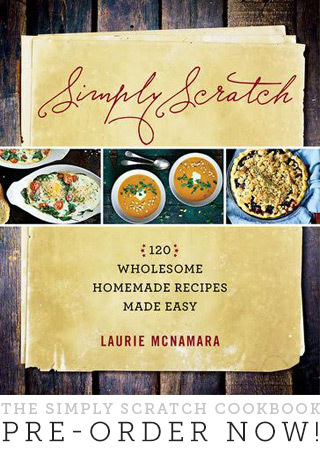 I adore recipes just like this! Feeds 4 to 6 in about 8 hours. Monday my girls had the day off from school. Yet I still woke up at 6:45 to put this Balsamic Dijon Pot Roast in my slow cooker. Yes, willingly. While it sat on my counter doing it’s thing, I went and picked up my groceries and put gas in my car. I was home from shopping and gas getting by 9:30 in the morning and my girls never knew. Until I woke them up with promises of pancakes. Their eyes pinged open like they were on springs. There’s something about having dinner in the slow cooker and my kitchen cupboards and fridge stocked that make me feel accomplished. This slow cooking is really growing on me and I’m starting to finally get why everyone loves it. Now I just need to get on board and buy an Instant Pot. 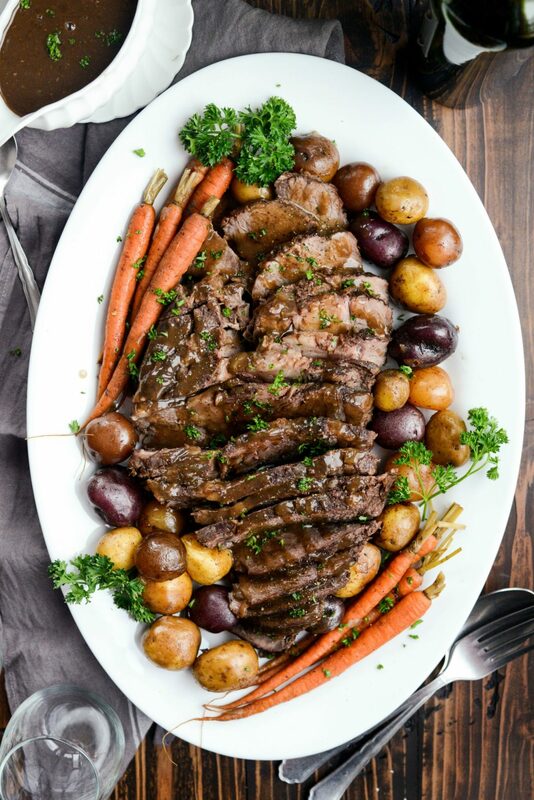 For prepping this slow cooker gem, you will need: 1 ( 3 to 4 pound) chuck roast, a bunch of (6 to 8) baby carrots, 1 large yellow onion (sautéed in 1 to 2 teaspoons olive oil), 1/4 cup dark brown sugar, 2 heaping tablespoons of Dijon mustard, 1/4 cup of balsamic vinegar, 1 tablespoon Worcestershire, 3 to 4 large cloves of garlic and red pepper flakes [<— totally optional], salt and pepper. Start by whisking together 1/4 cup dark brown sugar, 2 heaping tablespoons of Dijon mustard and then 1/4 cup of balsamic vinegar. Then add 1 tablespoon Worcestershire, 1 teaspoon kosher salt and 1/2 teaspoon freshly ground black pepper and 1/4 teaspoon of red pepper flakes into a medium bowl and set aside. Next, place the sautéed onions, [washed and trimmed] carrots, the smashed and peeled garlic cloves and the balsamic dijon sauce into a gallon size re-sealable bag. Then add in the roast, squeeze out as much air as humanly possible before sealing. Next lay the slow cooker balsamic dijon pot roast freezer kit flat to freeze. This way you will be able to stack more slow cooker freezer meals on top and maximize my freezer space. The morning before the day you plan to make the pot roast, pull it out of the freezer and place it into the fridge to thaw. I DO NOT recommend adding the completely frozen kit ingredients in to your slow cooker, doing so may affect cooking times and the outcome of the recipe. I also read a few opinions on putting food into the slow cooker from the freezer, that the contents might not reach a safe temperature to consume. However, partially thawed is absolutely fine. In fact, after my pot roast thawed in my fridge for 24 hours, the roast was still quite solid, but still not as rock hard as it was when it came out of the freezer. After 8 hours in the slow cooker it was perfect. 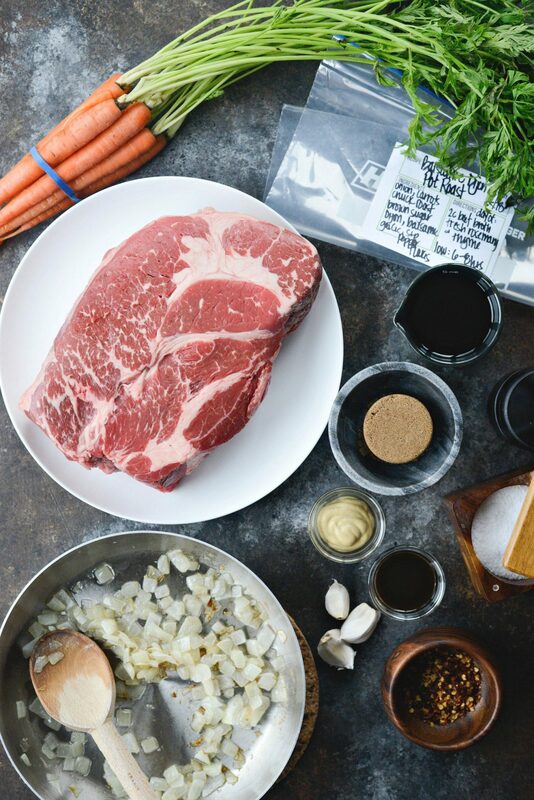 Day Of: First, place the entire thawed contents from the slow cooker balsamic dijon pot roast kit into your slow cooker. Then add in the potatoes, 3 to 4 sprigs of both rosemary and thyme. Next, pour in 2 cups of beef stock or broth. Then push the potatoes down to submerge them into the liquids. 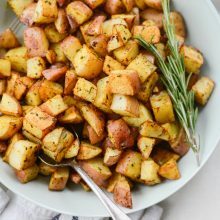 Cover and cook on low for 6 to 8 hours — the internal temperature of the roast should be 160° F. Obviously if you were making this with all fresh ingredients, you would just add everything in at once, set it and forget it. Once the pot roast is cooked, remove and discard the herbs. Transfer the potatoes and carrots to a serving dish and cover tightly with foil. Place the pot roast onto a large carving board (snagging a piece or two – shhh! I won’t tell) and covered it with aluminum foil as well to keep warm. Now you have two choices: 1) Pour the slow cooker liquids into a fat separator and wait for the fat to rise to the top. Then pour the juices (leaving the fat in the separator) into a sauce pan. Bring to a boil – this will happen quickly. Once boiling, whisk in a cornstarch slurry. For this mx together 1-1/2 tablespoons cornstarch mixed with 1-1/2 tablespoons cold water. Stir until the broth thickens into a glossy gravy. Season to taste with kosher salt and black pepper. Alternatively, you could just pour the (fat separated) juices into a gravy boat and serve it au jus style. I’m a gravy fuhreak, so I always go the gravy route. 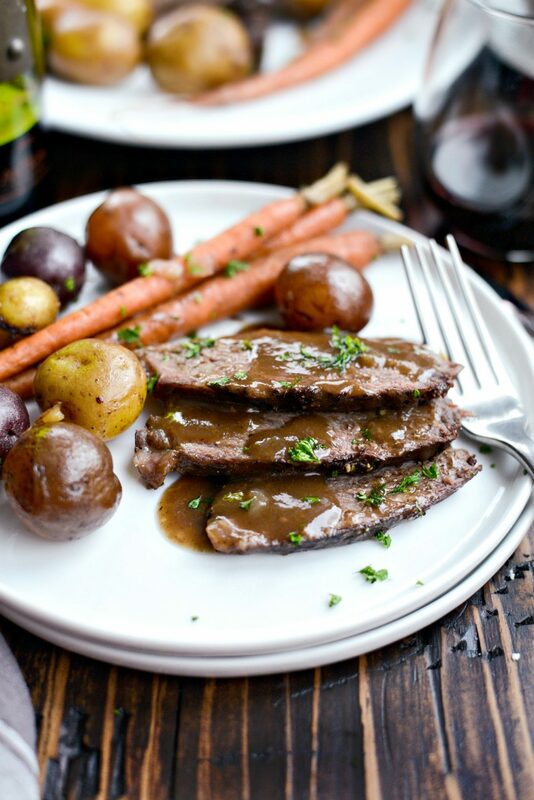 Slice the pot roast and serve with carrots and potatoes with a drizzle of the piping hot gravy. Add chopped fresh parsley for a pop of green and some freshness. 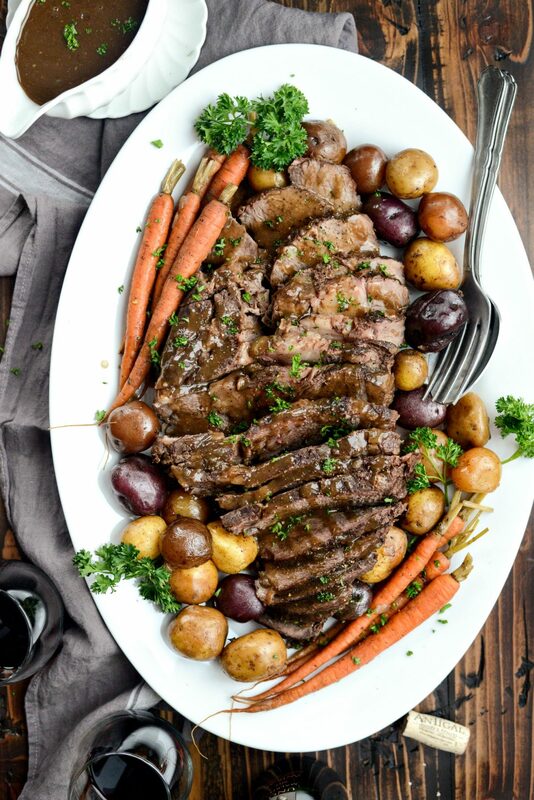 You guys, this slow cooker balsamic dijon pot roast is so dang delicious! It is comfort food at it’s absolute best. 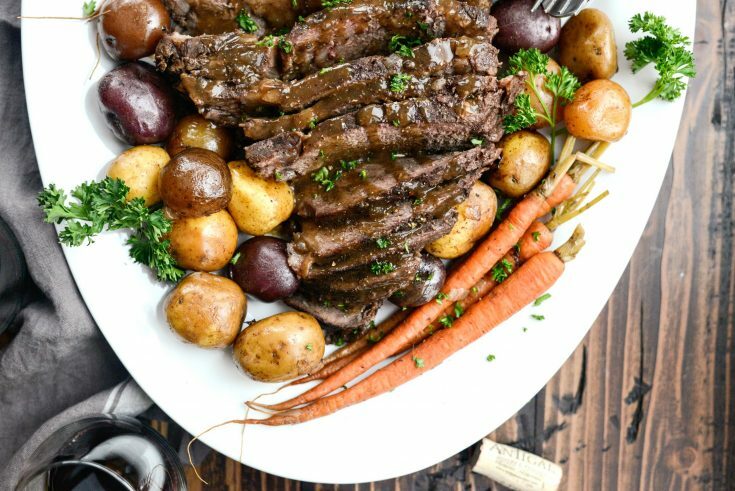 If recipes could be a expression, this pot roast meal would be a hug for your soul! And who doesn’t love a hug?? 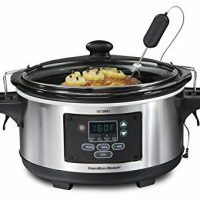 While I’m on a roll with these slow cooker recipes, what are some other slow cooker recipe ideas? I’ve got a few more still to share. However I’m always looking for more meals that I can make in advance. Especially ones I can prep and then pull from my freezer later. Enjoy! 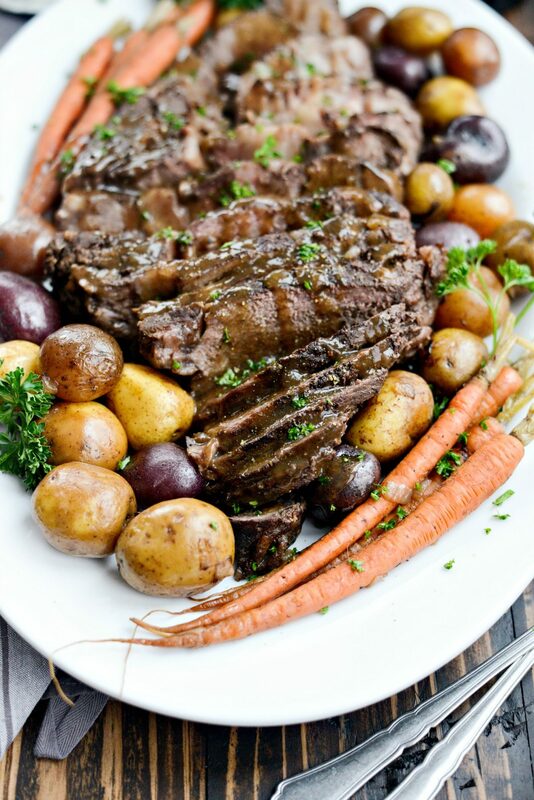 And if you give this Slow Cooker Balsamic Dijon Pot Roast recipe a try, let me know! Snap a photo and tag me on twitter or instagram! 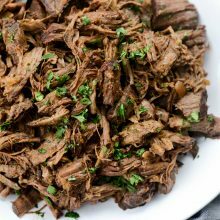 This Slow Cooker Balsamic Dijon Pot Roast is another recipe from my freezer kit repertoire, and it couldn't be any easier. 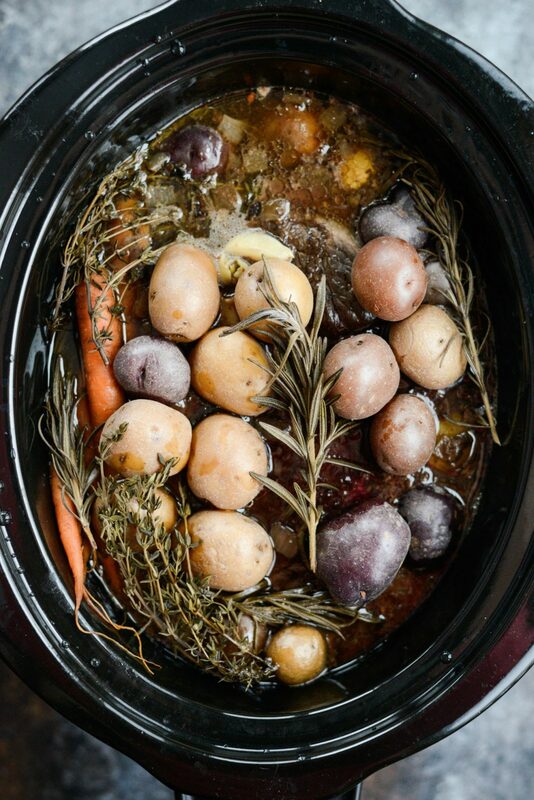 Beef chuck roast slowly simmers with potatoes and carrots with fresh rosemary and thyme in a balsamic, Dijon broth. And BONUS it’s freezer friendly and 95% can be made in advance, frozen and whipped up on a chilly day or when you’re just not in the mood to cook. 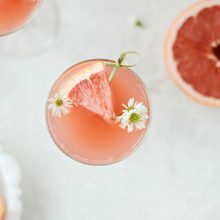 I adore recipes just like this! Feeds 4 to 6 in about 8 hours. Sauté the diced onion with a pinch of salt in a little olive oil until tender and the edges start to brown. Remove off of the heat and cool. 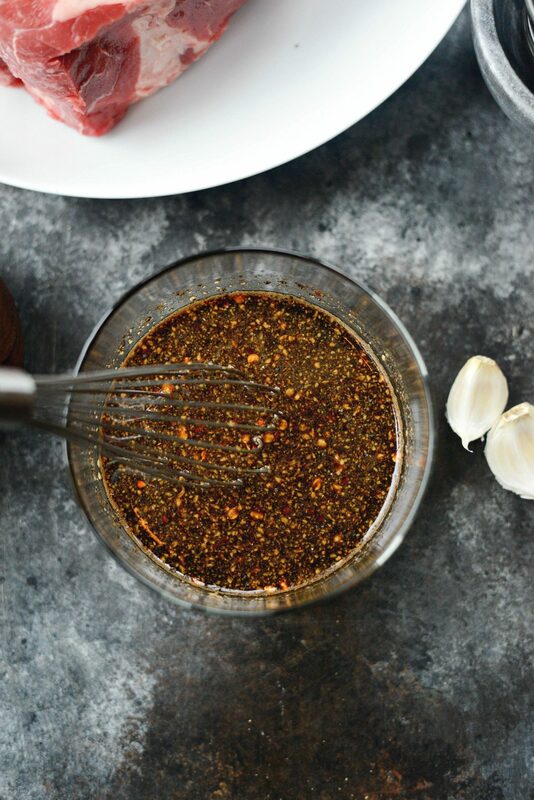 Meanwhile, whisk together the brown sugar, mustard, 1 teaspoon kosher salt, black pepper, red pepper flakes, balsamic vinegar and Worcestershire. 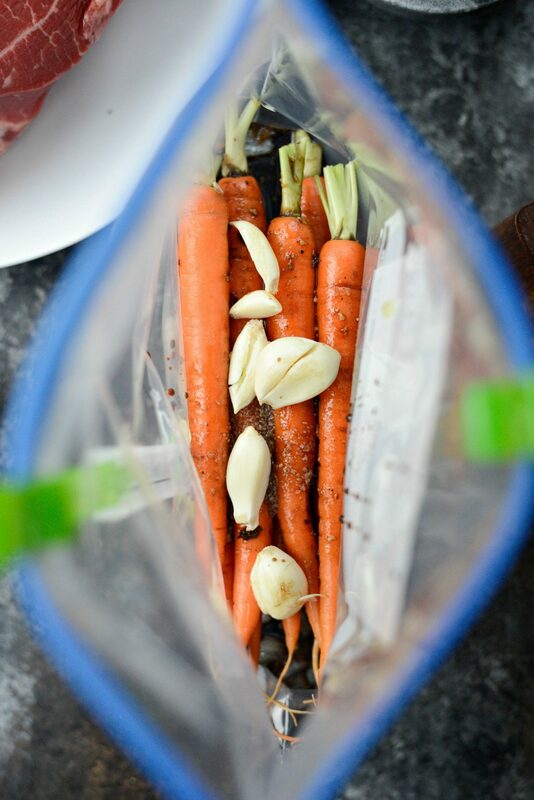 Add the cooled onions, carrots, garlic cloves and balsamic dijon mixture into a gallon resealable bag. Add in the roast and squeeze out as much air as possible before sealing. 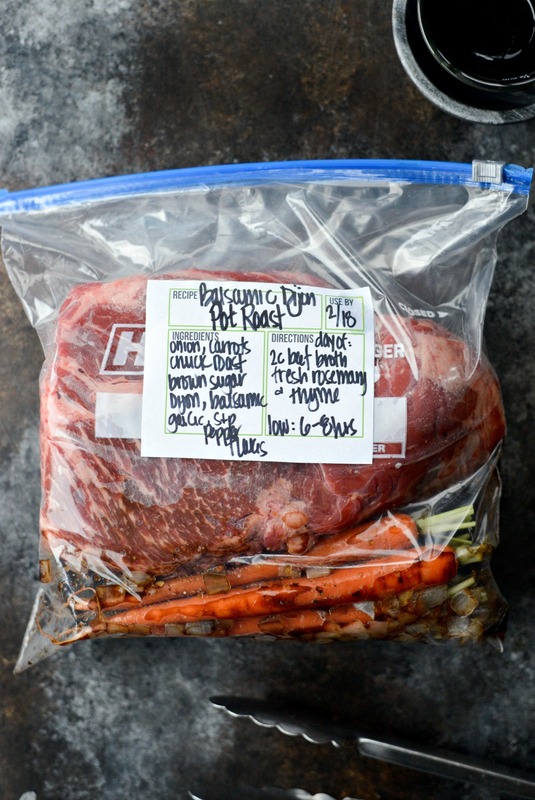 Lay flat to freeze, this makes it easier to store and for stacking other slow cooker freezer meals. 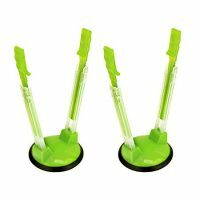 Store in your freezer for 3 to 4 months, possibly longer :). 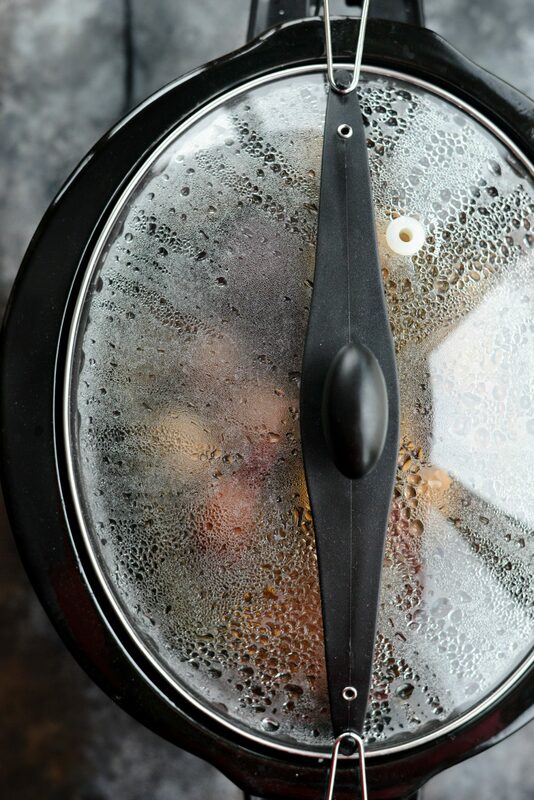 Remove the slow cooker kit from the freezer and place into your fridge 24 to 36 hours before you plan to make it. I found that if I take it out the morning before the actual day I plan make it, it will have plenty of time to mostly thaw out. I DO NOT recommend adding the completely frozen bag ingredients in to your slow cooker, doing so may affect cooking times and the outcome of the recipe. 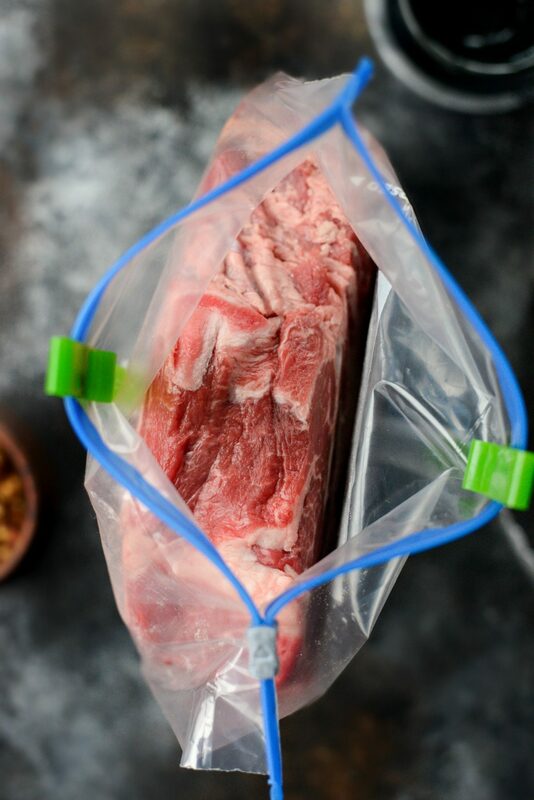 Unzip the baggie and empty the contents into your slow cooker (discard the bag) and add in the potatoes (sink them to the bottom if they're on top), rosemary, thyme and pour in 2 cups of beef stock or broth. Cover and cook on low for 8 hours. Once cooked remove the rosemary and thyme and discard. Then remove the roast to a cutting board and cover with aluminum foil. Remove the carrots and potatoes to a serving dish and cover with foil as well. Pour the slow cooker liquids into a fat separator (separator is linked above in post) and wait for the fat to rise to the top. Then pour the juices (leaving the fat in the separator) into a sauce pan and bring to a boil. Once boiling, whisk in a cornstarch slurry (this time I did 1-1/2 tablespoons cornstarch mixed with 1-1/2 tablespoons cold water) and stirred until the broth thickens into a glossy gravy. Season to taste with kosher salt and black pepper. Alternatively, you could just pour the juices as is (still separating them from the fat, just not thickening them) into a gravy boat and serve it au jus style. 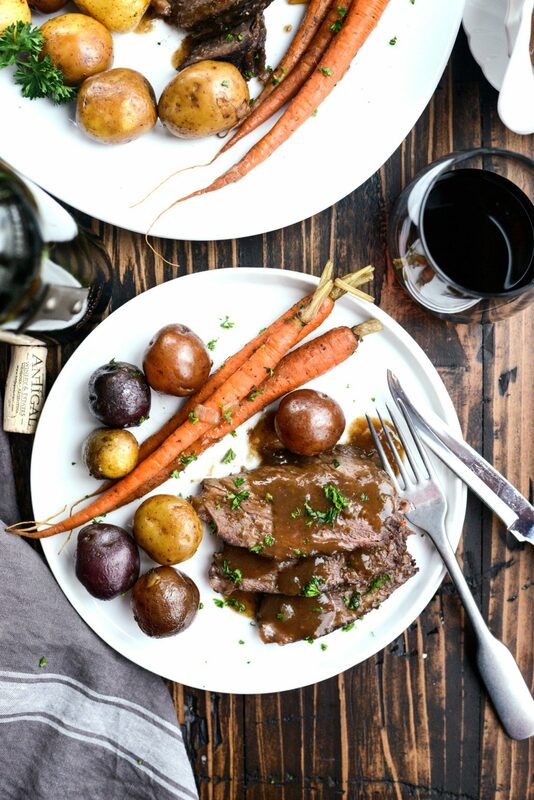 Slice the pot roast and serve with carrots and potatoes with a drizzle of the gravy. 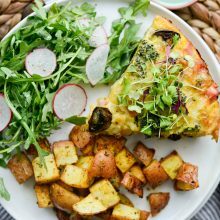 Add chopped fresh parsley for a pop of green and some freshness. 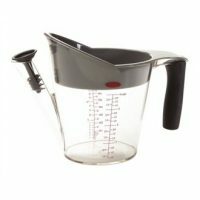 1 litre Oxo Good Grips Gravy Separator , Strainer , Filter , Pourer and Server . Where did you get the stickers for the bags? I have never seen those before. Thanks! Hi Chelai! I just added a link in the post, but here’s the one I use. 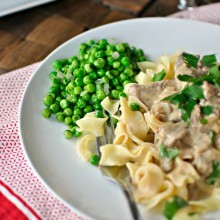 I am loving the freezer friendly meals you have been sharing recently! I’m due at the end of March with our second daughter and need ALL of the freezer friendly things. 😉 Thank you! I’ll see what I can do, Julie! If I wanted to skip freezing this and make it immediately, would I still follow the kit instructions and just move straight to putting it in the slow cooker? Hi Alison! Yes! If you wanted to, you could even take it a step further and sear the roast. It’s totally not necessary though. Other wise, just add it all in, set it and forget it. Enjoy! OMG! I have no words! This was incredible!!! Thanks for sharing! this was scrumptious!! my husband LOVED too. thank you! I’m so happy to hear it, Karen! I printed off this recipe a while ago and finally got a chance to make it yesterday. It was so good!! Way more flavor than I was actually anticipating. Thanks! That’s awesome, Annie! Thanks for taking the time to make this recipe!